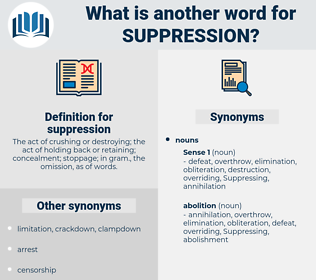 What is another word for suppression? The act of crushing or destroying; the act of holding back or retaining; concealment; stoppage; in gram., the omission, as of words. coercion, suspension, law-enforcement, destruction, inhibition, disappearance, repeal, removal, Compressive, depression, brutality, exclusion, deprivation, Neutralizing, revocation. repression, Suppressing, suppress, deletion, deletions, abolition, elimination, abolishment, crackdown, eradication, extinction, punishment, discontinuance. 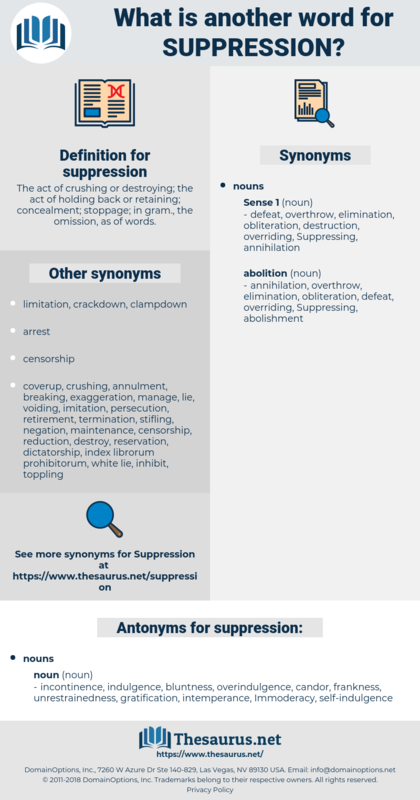 oppression, repression, persecution, proscription, compression, Suppressing, neutralization, subjugation, criminalization, suppress, clampdown, deletion, penalization, abrogation, phasing-out, erasure, trampling, retrenchment, suffocation, abolition, elimination, circumvention, criminalisation, abolishment, crackdown, concealment, neutralisation, containment, deterrence, dismantling, eradication, deactivation, halt, extinction, punishment, discontinuance, omission, sanction. incontinence, indulgence, bluntness, overindulgence, candor, frankness, unrestrainedness, gratification, intemperance, Immoderacy, self-indulgence. He also held strenuous opinions of the conduct of Government and the suppression of public evils, based obviously upon military views of things..
290 Events Preceding the Suppression, . growing, growth, ontogenesis, development, ontogeny, maturation.